From left, Cadet Colonel Tony Upton (1950-2010), Pacific Region; Cadet Lt. Col. Larry Willers, Rocky Mountain Region; Cadet Lt. Col. Stephen Graben, Southwest Region; Cadet Lt. Col. Diana Goodyear, Great Lakes Region; Cadet Lt. Col. Donald Maxfield, Southeast Region; Brigadier General Samuel Hallock duPont, Chairman, Civil Air Patrol; Cadet Colonel Thomas Richardson, Middle East Region and Cadet Colonel Harry Mertz, Northeast Region. 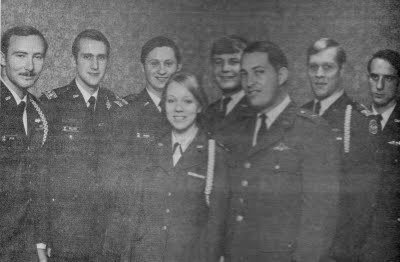 Civil Air Patrol history: On January 7 through 10, 1971 at the Statler Hilton in Dallas, Texas the first National Cadet Advisory Council met. In addition to the first National Cadet Advisory Council, the Advanced Cadet leadership Symposium was held with about 100 senior cadets and Jack Sorenson, National Commander Richard Ellis and Chairman of the Board Hal DuPont.